Oklahoma Connection | Ackerman moved to Oklahoma City, Oklahoma, in 1947 to work on the advertising staff of the Oklahoma Publishing Company. Ray Ackerman’s enthusiasm for his adopted state resulted in his writing and publishing the book, Tomorrow Belongs to Oklahoma in 1964. He also was the subject of Old Man River: The Life of Ray Ackerman. A native of Pennsylvania, Ray Ackerman served in the Navy a total of 35 years and retired from the U.S. Naval Air Force Reserves as a Rear Admiral. After World War II, he settled in Oklahoma City to begin a career that included founding Oklahoma’s largest and most successful advertising agency, Ackerman McQueen, Inc., Advertising and Public Relations Agency. He earned his Business degree from Oklahoma City University attending night classes as he maneuvered his way through the advertising business, eventually buying the agency he started with and opening offices in Tulsa (1967), Dallas (1978), and Washington, D.C. (1986). 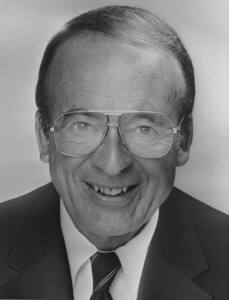 He received the Outstanding Graduate Award from the School of Business of Oklahoma City University (1964) and the school’s Distinguished Alumnus Award (1991). Ackerman has served on the board of directors of most major Oklahoma City civic organizations and received many of the city’s prestigious awards for community service, as well as numerous honors relevant to his career. In 2002, a fountain at the north end of the Bricktown Canal was re-christened the Ray Ackerman Dancing Fountain, in honor of his major role in the development of the Bricktown Canal and the North Canadian River in downtown Oklahoma City. In 2004, he and his wife, Lou, were named “Living Treasures” by the Oklahoma Health Center Foundation. See pictures of Ray Ackerman and other media HERE.